An inter-generational group of nearly 40 Green ReEntry cohort members, staff and leaders traveled to Washington D.C. this March for a weekend of reflection, solidarity and learning. 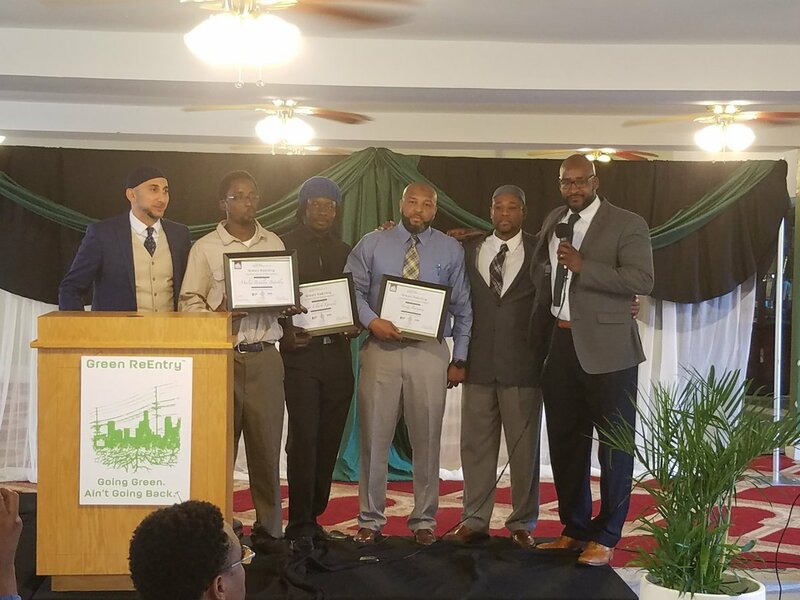 The trip gave many brothers their first opportunity to serve as ambassadors for Green ReEntry–and IMAN–outside of Chicago. This visit to our nation’s Capitol was highlighted by the group’s participation in the massive March for Our Lives event held in downtown Washington. Alongside 700,000 people from across the U.S., the Green ReEntry brothers demanded an end to the gun violence plaguing communities throughout the country. 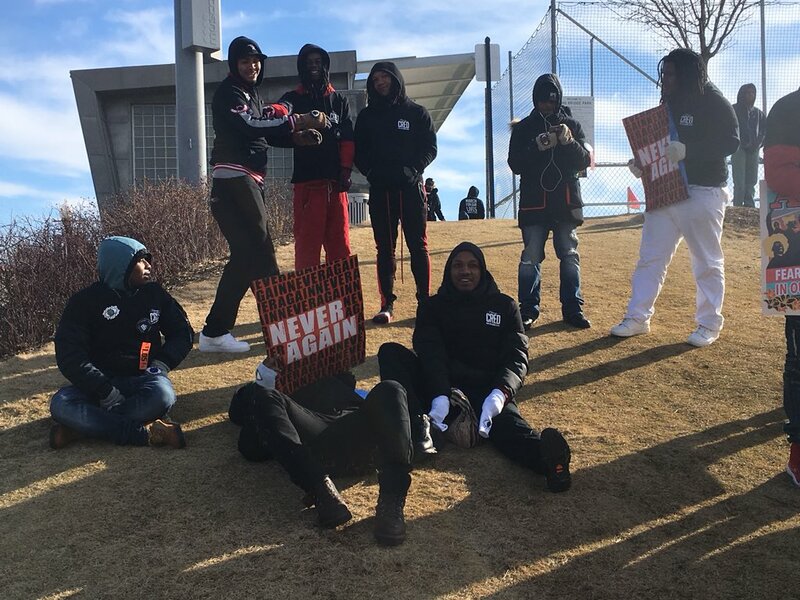 Many cohort members have lost loved ones to a bullet, and the group marched throughout the day carrying the memory of former cohort member Steven Ward, who was shot dead last December. The Green ReEntry cohort was then hosted in Baltimore by longtime IMAN ally Saafir Rabb, who led the group on a tour around his hometown. Rabb has helped lead many successful property development projects in Baltimore, and he readily shared wisdom and laughs with his eager guests. During an in-depth exploration of a current embassy renovation, Rabb connected young cohort members with several older colleagues working in carpentry, masonry and heating/ventilation fields. As the trip ended, Green ReEntry case workers arranged for a tour of the historic Howard University. Both high school completion and educational achievement are interwoven into cohort members’ goals, and immersing themselves in the college campus environment provided many opportunities for networking. After visiting the pioneering community at D.C.’s Masjid Muhammad, the cohort loaded the bus and returned to Chicago with rejuvenated spirits and a deepened sense of unity. 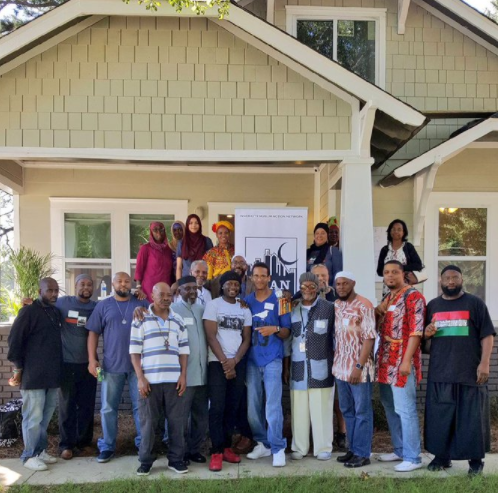 IMAN Atlanta has been extremely active as it continues to carve out its place in the larger metro area. The Atlanta Green ReEntry cohort broke ground on its first renovation project along with dozens of local volunteers. 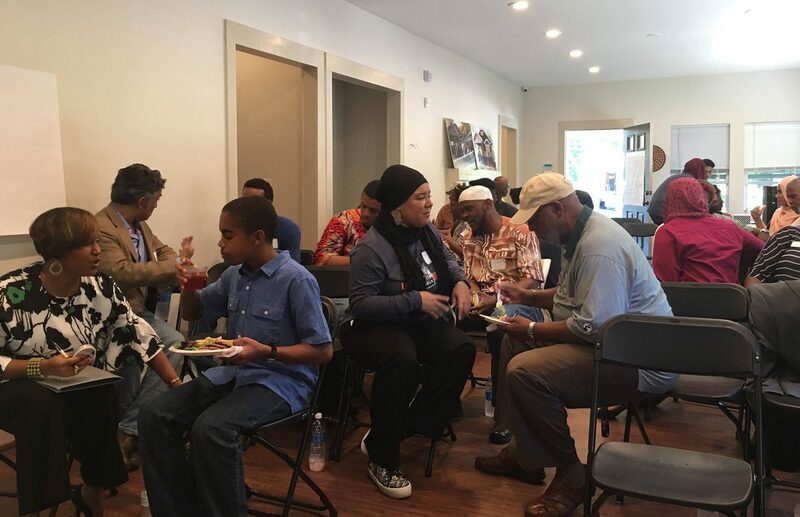 In addition to launching the reentry work, IMAN ATL staff and leaders played key roles in several interfaith efforts that successfully highlighted the importance of health, wellness and healing in an inner-city context. 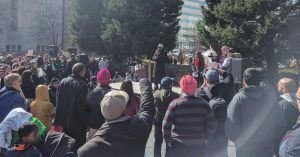 IMAN Atlanta played a key organizing role during a well-attended rally held in downtown Atlanta. Alongside allies from Redeemer Lutheran Church and other organizations, they called on residents to band together in support of groups targeted by proposed federal policies. 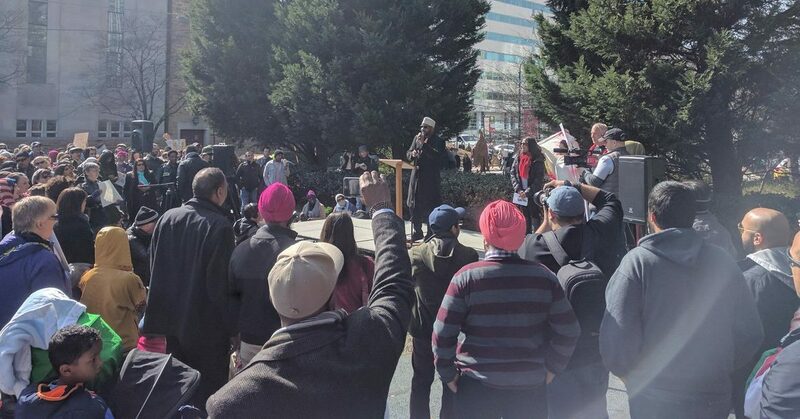 In conjunction with the Interfaith Children’s Movement, IMAN Atlanta staff and leaders also traveled to the state capitol for an important Advocacy Day. They pushed local legislators on several critical issues affecting the state’s youth, from increased job opportunities to more equitable, accessible public services for young people of all backgrounds. 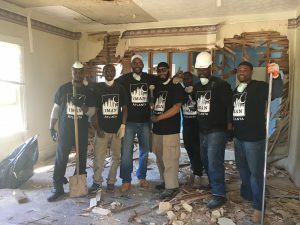 On February 25, Director Mansoor Sabree and Atlanta Green ReEntry Coordinator Jermaine Shareef organized a “Hands On” community event, which served as a public groundbreaking for the IMAN ATL team’s first renovation project. Nearly 50 community members joined the first-ever Atlanta re-entry crew for a tour of the new property. 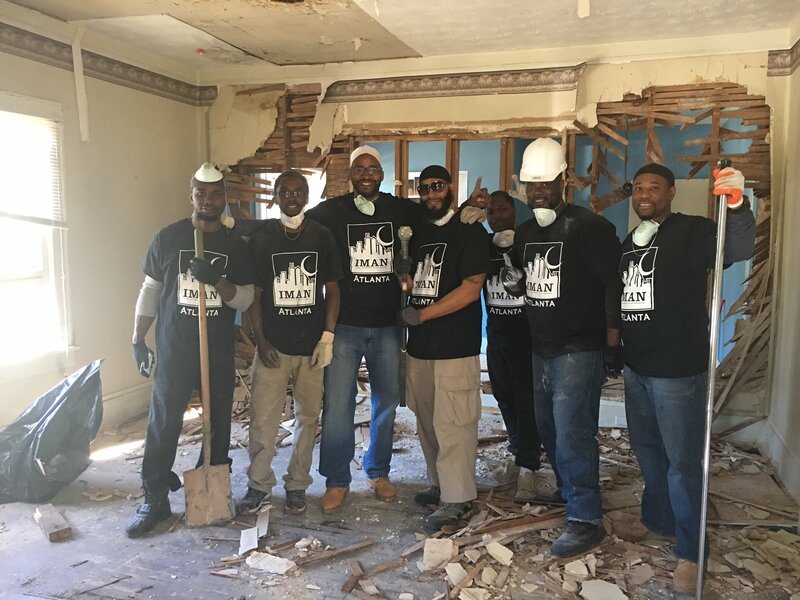 After the tour, many attendees also rolled up their sleeves and chipped in to help beautify IMAN ATL’s soon-to-be headquarters. 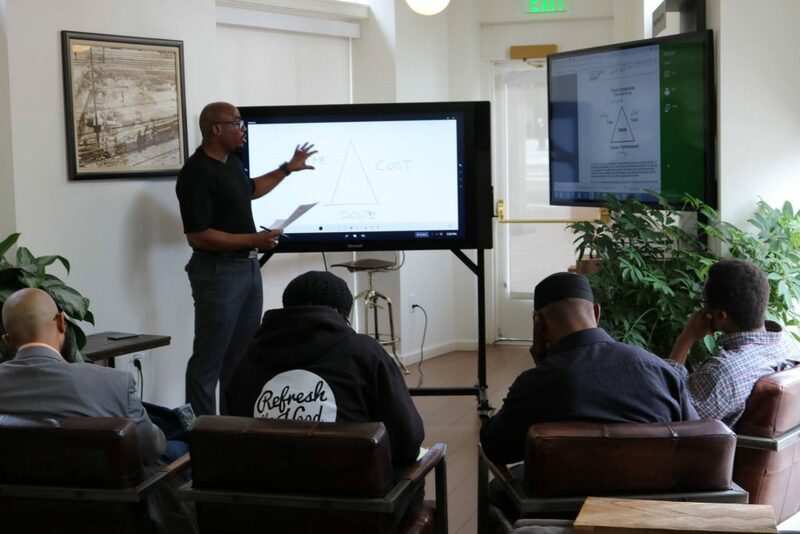 IMAN Atlanta continues to establish itself as a vehicle for Georgia residents to engage the issues most directly affecting them. Be sure to follow IMAN ATL on Facebook to support their work, and for all the latest news and updates.